Tigers’ Overtime Despair Ends Playoff Hopes. Hexagon Telford Tigers 1 travelled to Ice Sheffield on Sunday night for the second leg of the NIHL North Playoff semi final. Tigers had won the first leg of the contest 3-2 in Telford on Saturday night with goals from Jason Silverthorn, Andy McKinney and Jack Watkins. Joe Hazeldine returned to the line up after missing the last three games and was joined by Dan Mitchell, Henry Adams, Fin Howells and back up net minder Ryan Lewis from the U18 team. The game would be the last of the season for the loser of the tie, with the winner going on to the northern final next weekend and also gaining a guaranteed place in the NIHL Final Four competition in Coventry in two weeks’ time. In goal for Telford was Tom Hovell and in goal for Sheffield was Dimitri Zimozdra. A scrappy first period saw few clear cut chances. Both teams knew the importance of the opening goal and it would be Tigers who scored it, six minutes into the game. Adam Taylor led a breakaway and found McKinney behind the goal who passed to the onrushing Scott McKenzie to hit a wrist shot which hit Zimozdra and went through him into the goal. Initially the goal was not given but referee Emmerson consulted that goal judge and then awarded the goal. The closest Sheffield came to scoring was when Milan Kolena hit a shot straight at Hovell from a tight angle and the puck was cleared from the goal crease by McKenzie. Tigers ended the period on the attack with Ricky Plant’s goal-bound shot deflected away by a Sheffield defender’s skate. The second period was similar to the first with few clear cut chances. Joe Hazeldine weaved his way through the Sheffield defence and created space but his shot went through the goal crease from a tight angle. Kolena then went close for Sheffield with a shot from behind the goal that almost banked off Hovell into the goal. As the period entered the final three minutes, Sheffield applied considerable pressure and this finally paid off. Hovell left his net to play the puck behind his goal but his clearance went straight to James Spurr on the boards, Spurr sent a first time shot back towards goal, with the puck hitting Hovell and then going into the goal to level the game on the night. Tigers made the perfect start to the third period with a second goal. Sheffield’s attempt to clear the puck failed as it deflected into the path of Jack Watkins, who skated in on goal and hammered the puck low past Zimozdra. Tigers failed to hold the lead as Sheffield equalised four minutes later through Duncan Speirs. Just two minutes later, Kolena scored with a shot from in the corner of the Tigers’ defensive zone, adjacent to the goal line, which surprised Hovell in the Tigers’ goal. The tally levelled the contest on aggregate and despite some late Sheffield pressure on the Tigers goal, the two teams could not score a further goal sending the game to sudden death overtime. The team that scored would win and progress to the final. Sadly it was Sheffield who would get the deciding goal, Spurr scoring his second of the game just forty seconds into the extra period with a powerful slap shot that gave Hovell no chance. The goal ends Tigers’ trophy hopes for the season and brings a close to the 2018/19 campaign. 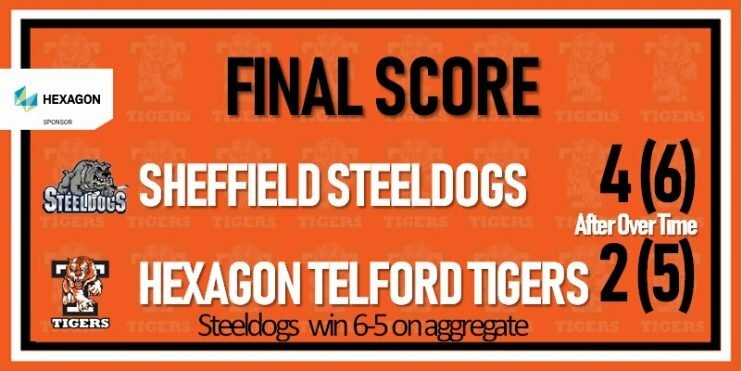 Final Score: Sheffield Steeldogs 4 (6) Hexagon Telford Tigers 2 (5) (Sheffield win on aggregate 6-5 after overtime). Scorers: Scott McKenzie, Jack Watkins.